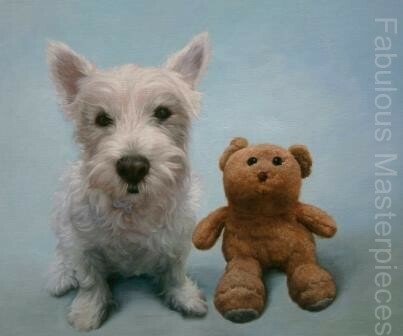 I just wanted to show you our lovely oil painting of Amber the dog that we’ve just finished painting. I think it’s one of the best dog portraits we’ve ever done. This is the photograph of Amber that was emailed into Fabulous Masterpieces. 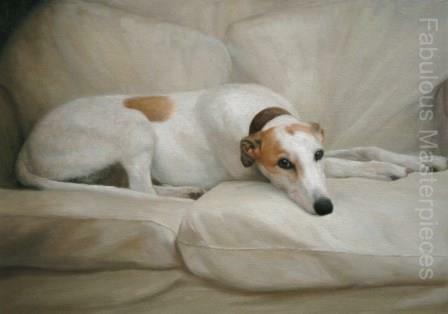 The owner didn’t want the artist to paint the pattern on the sofa as we all felt it would make the dog portrait too “busy”so the dog artist painted it in cream. If you’re a dog lover, which hopefully you are, if you’ve found yourself on this page then commissioning a professional dog artist (by which I mean an artist that solely specialises in painting dogs) to paint a wonderful oil portrait of your dog is priceless. So many owners contact us in order to commission a dog portrait because their dog is ill or has passed away and they want to commemorate their dog as they remember them with a beautiful painting. Would you like a quote for your dog’s portrait? 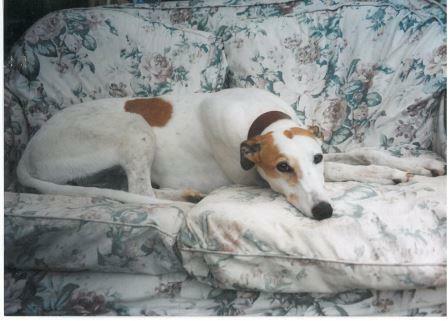 All we need from you is a photo or 2 of your dogs and a rough idea of size, then we can advise you further. Prices start from £250 and world-wide delivery is free.